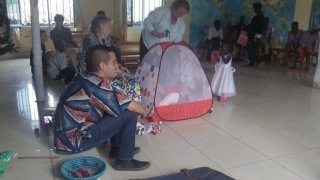 Each child received a gift. A Christmas tree ornament in the form of the BIRD OF PEACE was presented to our guests. On each bird was printed URUKUNDO XMAS 2013. We became so involved in giving we forgot to take pictures of gifts under the tree. These bags were special. Each of our children received a bag with gifts just for them. We prepared them before the great day arrived as is the custom for Christmas gifts if you are the mum. This folding reading room was unique as gifts go.